The perfect size case for displaying your military flag or a USA flag, and also provides a ample amount of space for your memorabilia. This case is available in either Red Oak, Walnut or Cherry and comes with a red, black, blue or green backround. Holds one flag up to 3'x5' each. Mounting backet is included. 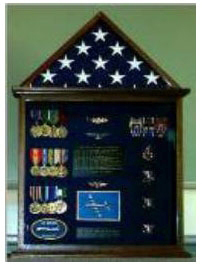 The Flag and Medal Display case is Made in USA. The Flag and Medal Display case Is made by Veterans. The Flag and Medal Display case is Hand Made. The Flag and Medal Display case is made out of a real wood. The Flag and Medal Display case can be hanged on the wall. The Flag and Medal Display case is shipped within 1-2 bussness days. The Flag and Medal Display case is great to present american flag and badges.